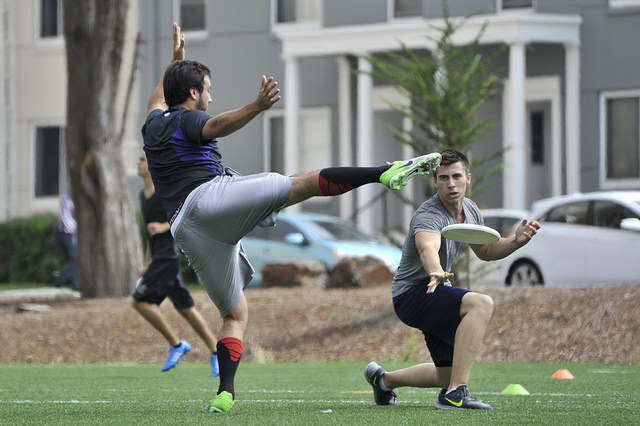 SF State’s ultimate Frisbee team took the field earlier this month, preparing to improve on its winless season from a year ago. 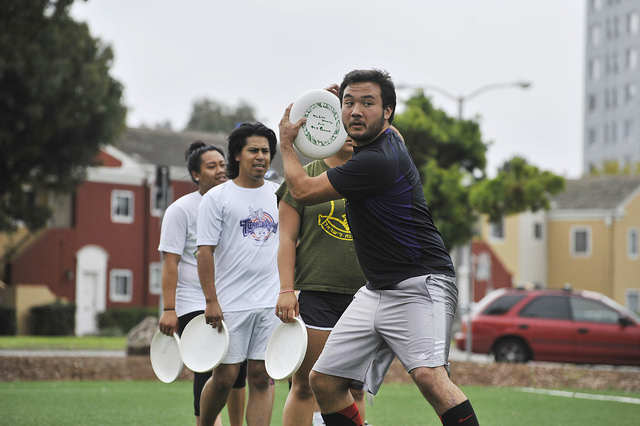 Veteran players from the Turnips ultimate Frisbee team said its roster quickly filled out with students hoping to stay active without dealing with the usual rigors of collegiate athletics. Jacob Hsieh, 22, prepares to throw a disc during drills at Ultimate Frisbee Club practice on the West Campus Green on Friday, Sept. 12, 2014. Sara Gobets / Xpress. The University’s club holds open practices on the West Campus Green Tuesdays and Fridays at 1 p.m., and Team Captain Graeme Brunst said the showing is impressive. Brunst described ultimate Frisbee as a mixture of football, basketball and soccer. Teammates pass the disc to one another, never running with it, and score when a pass is connected in the end zone. A dropped pass is considered a turnover to the opponent, only without the lag time or play clock that you’ll find in football. The pace of play in ultimate Frisbee is quick, fluid and constant. But stroll past the West Campus Green to check out a practice and you will see the sport is atypical in many ways. Ultimate Frisbee takes everyone’s favorite beach activity to another level, giving busy student athletes a chance to stay active and have fun. Because the sport is student-run, there is no league, meaning all games are tournament-based. But an even bigger gap separates ultimate Frisbee from other collegiate sports: there are no referees. Jacob Hsieh, 22, extends his leg to try and block Tori Suarez’s throw during Ultimate Frisbee Club practice on the West Campus Green on Friday, Sept. 12, 2014. Sara Gobets / Xpress. Brunst said they welcome players of all skill levels, like Tony Barbieri, a 23-year-old senior without any prior ultimate Frisbee experience. Barbieri said he found the team tabling at the start of the semester and decided to join up. “Everyone is really welcoming and willing to teach you,” said Barbieri, who grew up playing basketball competitively, but had to call it quits after he injured his knee. Barberi said he was looking for something to keep him active and help him meet new people, and ultimate Frisbee gives him that. “I like that (ultimate Frisbee is) laid back,” said Claudia Arquero, an 18-year-old freshman on the team whose only prior experience with ultimate Frisbee was a crash course and one game in the SF league. Arquero said that, like Barbieri, her background is in basketball and track, and while she is weighing her options on continuing to pursue those sports, she wants to stay active through ultimate Frisbee. 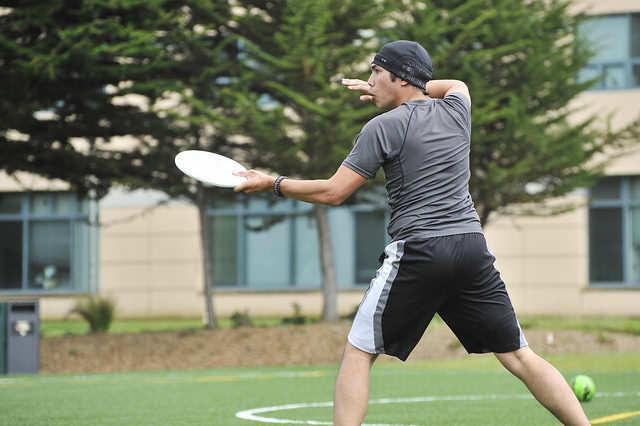 Not everyone on the team is discovering ultimate Frisbee for the first time at SF State. Brunst said he has played since he was 16 years old. Cloud Monteclaro, 18, throws a disc during Ultimate Frisbee Club practice on the West Campus Green on Friday, Sept. 12, 2014. Sara Gobets / Xpress. At only five practices in, the team is getting its bearings and developing a schedule. SF State’s first tournament takes place Oct. 18 and 19 in Chico, followed by another on Oct. 25 and 26 at Sonoma State University. The team is also scheduled to play in the College Sectional in May – a tournament that determines which teams go on to the Regionals and, eventually, the Nationals. Seeding in the tournaments is based on performance historically, and after a rough season last year, Brunst expects to be seeded near the bottom of the 16-team pack when they show up in Chico. But that’s only motivation for this SF State squad, and especially for newcomers like Barbieri.